Launched in the aftermath of a deep economic crisis and set up on the basis of a broad urban consultation, Quito’s Participatory Urban Agriculture Programme promotes the production, processing, marketing and distribution of healthy organic food from urban and peri-urban gardens in the Metropolitan District of Quito. In its 16 years of existence, AGRUPAR has continuously expanded and considerably advanced food security, job creation, income generation, environmental management, gender equity, social inclusion of vulnerable groups such as women, elderly and migrants, and micro-entrepreneurship. Due to its impressive socioeconomic and environmental impact, its participatory and holistic approach involving the most vulnerable groups, and its full respect for the Future Justice Principles and Elements of Agroecology, AGRUPAR was recognized with the Future Policy Silver Award 2018, awarded by the World Future Council in partnership with FAO and IFOAM – Organics International. Quito’s AGRUPAR Programme was launched in 2002 in the aftermath of a deep economic crisis, due to which 48 per cent of the population of the city were living below the poverty line. AGRUPAR’s aim is to improve the life of the most vulnerable groups – foremost women, elderly and persons with disabilities, but also unemployed, refugees, migrants and indigenous people – through agricultural activities to advance food security and food sovereignty, improved incomes, job creation, environmental management, gender equity, social inclusion and the generation of productive activities. The Programme works along the entire food chain and focuses on producing, processing and distributing healthy food from urban and peri-urban gardens. It provides technical assistance and capacity-building; creation of production infrastructures and livestock improvement; management of micro-entrepreneurship; marketing and promotion; access to microcredit; and applied research to facilitate agroecology. In the past 16 years, AGRUPAR has achieved significant improvements in access to and local availability of healthy food for vulnerable groups (both producer and consumer families), increases in income and conversion of abandoned and waste spaces to productive land. AGRUPAR shows how an integrated approach can lead to great success. It explicitly recognizes and formulates the role of urban agriculture for wider social, ecological and economic policy aims, and works along the entire food chain, from production to promoting value-adding entrepreneurial activities, from marketing and establishing dedicated commercialization channels, to food waste reduction. In its 16 years of existence, the Programme has expanded and considerably advanced food security, job creation, income generation, environmental management, gender equity, social inclusion and micro-entrepreneurship. For its noteworthy accomplishments, Quito’s programme won the Future Policy Silver Award 2018. Promotes organic agriculture, recycling, composting, rainwater harvesting amongst others. Enhances biodiversity, integrates small livestock and uses no pesticides or GMOs. Produces nutritious and culturally adapted food, and creates reen spaces in town. Focuses on vulnerable groups, i.e. women (84%), elderly (27%), etc..
Educates, empowers and boosts livelihoods. Enhances integration of marginalized groups and their recognition. Links consumers and producers, uses local knowledge and materials, and innovates. Prevents the expansion of export-oriented cultures (which use agro-chemicals). Produces according to Ecuadorian Organic Agriculture Law of 2007, e.g. there is certification and control. Raises awareness and contributed to the rescue of traditional Andean crops. Developed in a participatory, urban consultation, involving many actors including entrepreneurs. Participants are active partners and shareholders. Works very transparently, offers access to information and undertakes excellent data collection. Good governance, e.g. politicians were not allowed to use the AGRUPAR in elections. Cooperates with many NGOs and mobilizes other sectors within the municipality. Recognizes urban farmers as guardians of natural heritage and biodiversity. More has to be done on securing access to land. Addresses transversal aspects, incl. economic development, and is multifunctional. Is included in the developement plan of Quito, its strategic vision 2040, and the Climate Change Plan; and at the national level it was part of INTI. Very adapted to the way of life in West Africa. Promotes urban production, thereby food sovereignty of marginalized people. Focuses on the city’s needs, to produce food with local materials and resources. Highly inclusive: no cost for vulnerable groups and very low cost for others. Between 1980 and 2000, the arrival waves of migrants from other parts of the country almost doubled Quito’s population, from 780 000 to 1.4 million. In inner-city barrios and settlements built on surrounding hillsides, many people resorted to small-scale agriculture, based on conventional practices, to feed their families. This meant that urban agriculture in Quito became widespread, but was unrecognized. With its geographic position and mountainous topography, Quito is highly vulnerable to climatic changes, already experiencing higher average temperatures, an overall decrease in rainfall, and more extreme rain events, which cause landslides. In the late 1990s, Ecuador suffered a severe economic crisis, which resulted in a sharp drop in public spending and an increase in internal migration and emigration. In 1999, 48 per cent of Quito’s population was living below the poverty line. The city urgently needed to address overcrowding and food insecurity. In 2000, Ecuador’s capital hosted a meeting of local government representatives from Latin America and the Caribbean. The outcome of this event was the landmark Quito Declaration, the first to call on the region’s cities “to embrace urban agriculture”. In the same year, an urban consultation on agriculture was organized by Quito, resulting in a pilot programme, launched in September 2000 and co-funded by the municipality and international partners, which increased food production in home gardens, promoted the recycling of organic waste, and established a community plant nursery. It also developed a microcredit system and implemented projects for processing and marketing produce. 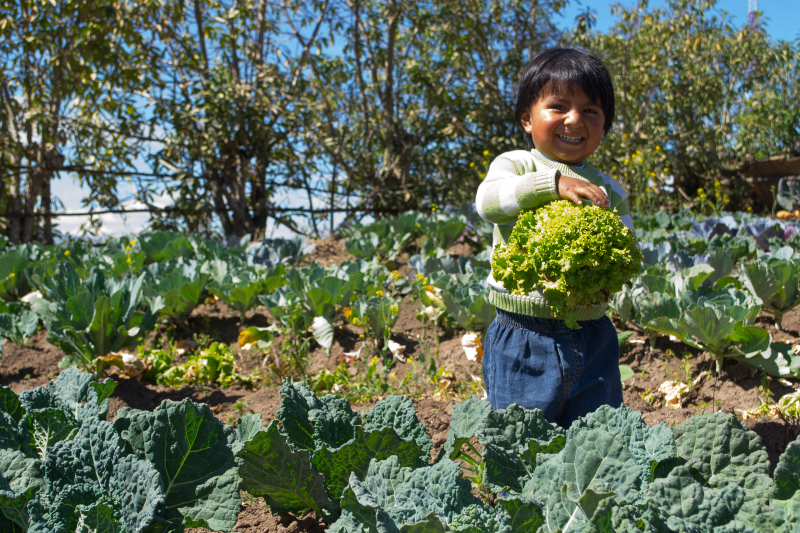 The lessons learned were used to develop a municipal programme aimed at improving the food security of vulnerable populations in Quito’s urban, peri-urban and rural areas. The Participatory Urban Agriculture Programme (AGRUPAR) was launched in 2002 and was initially managed by the city’s Directorate for Sustainable Human Development. Since 2005, AGRUPAR has been implemented by the Economic Development Agency (CONQUITO), whose mandate is to create an entrepreneurial, sustainable and innovative city. Today, AGRUPAR is one of CONQUITO’s most successful initiatives. Key moments in its development over the years were the launch of the bioferias (bio-fairs) in 2006, the organic certification for garden groups from 2007 (renewed every year), and the certification of labour competencies of urban farmers from 2009 and 2012, with the help of the Ministry of Social Development and funding from the National Technical Secretariat for Training and Education. In 2010, the project was recognized within the organizational structure of CONQUITO and since then has received exclusive municipal funds for its execution. In 2012, a Resolution conferred more formality to the execution of AGRUPAR within CONQUITO, meaning that urban agriculture in Quito is now institutionalized as a permanent service. In 2013, a Collective of Urban Farmers (3,000 members) was formed. AGRUPAR improves the quality of life of vulnerable groups in the Metropolitan District Municipality of Quito (DMQ) through agricultural activities which advance food security and food sovereignty, improved incomes, job creation, environmental management, gender equity, social inclusion and the generation of productive activities, by producing, processing and distributing healthy food from urban and peri-urban gardens. Its objectives are: 1. Strengthen technical capacities of (peri-)urban farmers; 2. Increase agricultural production and agribusiness in a sustainable way with a focus on micro-management; 3. Connect this production with markets (short chains); 4. Strengthen community organizations; 5. Promote self-managed community banks; 6. Improve public policy. Especially targeted are female-headed households, the elderly, children and youth, social and rehabilitation centres, migrants and education units, amongst others. Participants are from poverty quintiles 1 and 2, the level of education is low, and 30 per cent receive government human development vouchers. Responsible for policy is the Metropolitan District Municipality of Quito (DMQ). AGRUPAR is implemented through Quito’s Metropolitan Economic Development Agency (CONQUITO), reporting to the Secretary of Productivity and Competitiveness of the DMQ, with the engagement of NGOs, academia and students. AGRUPAR’s implementation strategies are the following: technical assistance and capacity-building; creation of production infrastructures and livestock improvement; management of micro-entrepreneurship; marketing and promotion; access to microcredit; and applied research. Support for urban, community and institutional gardening for home consumption and the sale of leftovers. People are trained in organic production, management skills, nutrition, food processing and marketing. AGRUPAR provides producers with seeds, seedlings, poultry, guinea pigs, bees, inputs and equipment. It supports community gardens, family gardens and gardens in schools and other institutions, as well as small livestock production units. It also promotes vertical farming. Community gardens are established on communal land, or on land that the municipality rents out for a minimal price to growers, and receive an organic certification by AGRUPAR, whilst family gardens are established on individually owned land. Not all orchards require an official organic certification, for example the orchards intended for family self-care do not require this process. For this reason, the project has implemented an internal control system (SIC, which is very similar to a system of participatory guarantees) for all orchards (certified or not) to ensure compliance with Ecuadorian organic production regulations. It should be noted that that AGRUPAR does not provide official land titles. In 2018, AGRUPAR plans to open an additional 200 gardens. Support for market-oriented local production in the DMQ region. Once producers achieve household food security, AGRUPAR encourages them to form microenterprises and trains them in business planning, marketing and accounting. The microenterprises are not only engaged in the production of vegetables, fruits, small animals, fish and ornamental plants, but also in the processing of jams, cookies, yogurt, cheese, drinks and traditional snacks. Producers who lack the necessary capital are supported through grass-roots investment societies, where each member contributes USD 10 to 20. Food supply and distribution. Food is sold in organic produce markets – the bioferias –located in low-income neighbourhoods and peri-urban zones, as well as in better-off parts of the city. As well, the District Trade Coordination Agency has begun to consider the large-scale commercialization of agro-ecological and organic foods through its markets and opened a first market of this kind, including for farmers supported by AGRUPAR. To help producers meet food quality and safety standards, AGRUPAR has introduced improved processing technologies and the use of containers, packaging and labels. To ensure quality of production, the bio-fairs are only open to producers who have followed the Programme. In addition to the bio-fairs, networks of farmers have been formed to deliver organic produce directly to local food processing companies and to hotels and restaurants. AGRUPAR is registered as a producer and marketer of organic produce at the national level allowing it to share the cost of product certification with participating producers. Promotion of food consumption, healthy diets and nutrition through bio-fairs and education. The DMQ’s annual contribution to AGRUPAR meets the cost of training, technical advice and logistics. It also covers part of the costs of seeds, inputs, equipment and the supply of animals to participating producers, with producers also contributing from their own means. While the local government remains the primary source of funding, around 25-33 per cent of the investment in productive infrastructure – such as greenhouses and small sheds for animal husbandry – is contributed by participating farmers. Participants also pay a symbolic price of USD 1 per training session and USD 2 for a technical assistance visit, with pensioners, children, people with disabilities and other vulnerable groups exempted from such payments. Budget: Since 2010, AGRUPAR has had its own budget within the annual operational plan of CONQUITO. In 2018, its budget is USD 283,336, mainly financed by the DMQ (about USD 255,842) and a self-management fund (sale of services, about USD 27,495). Ninety per cent of the budget is allocated to financing the technical team, the remainder is used for organic certification, developing the Food Policy of Quito, the Interpretation Center for Urban Agriculture of Quito, communication, and technical assistance. Over its 16 years of existence, AGRUPAR has achieved impressive results. As of 2018, it reaches 4,500 beneficiaries from highly vulnerable populations annually and covers 83 per cent of the district. Since its establishment, the Programme has: directly benefitted 73,936 people and indirectly helped a further 113,774; implemented a total of 3,679 urban gardens, covering 32 hectares, of which 60 per cent are family gardens and 26 per cent are managed by 380 organized groups (with 1,520 participants); incorporated 21,746 persons in trainings, of which 84 per cent were women; organized 16,172 technical trainings and 81,886 cases of technical assistance; and built 2,051 productive infrastructures (1,072 micro-greenhouses and 979 drip irrigation systems). Today AGRUPAR’s participants annually produce more than 960,000 kg of food products. Almost half of the production (47 per cent) is used for home consumption, strengthening food security and diversifying the diets of the 12,000 participating urban farmers and their families, while the other half is marketed. The Programme created 17 bio-fairs where 105 types of food are offered. Through these, 25% of the produce is commercialized, for about USD 350,000 per year. Since 2007, a total of 6,663 bio-fairs have been organized and all produce is organic. Both formal organic certification for orchards with marketing possibilities (since 2007) and the internal control system (SIC, since 2013) are used. As of 2010, the Programme had created five associations of producers and therefore generated better opportunities for the commercialization of products. Moreover, 48 community banks were created to provide credit services to participants. Besides strengthening food security, AGRUPAR improves the incomes of vulnerable groups. Half of the participants generate revenue as well as employment. Around 177 started entrepreneurships, of which 104 are formalized. On average their income is USD 3,100 per year and, since 2016, they have created 337 jobs. On average producers benefit from USD 175 of additional income per month. Total savings are more than three times the value of the government human development voucher (USD 50 a month). However, most of 480 participants surveyed in 2010 said that for them the increased quality of life, improved nutrition and health, and personal empowerment were even more important. It is noteworthy that AGRUPAR enjoys a high acceptance among its beneficiaries (over 91 per cent). AGRUPAR also promotes healthy diets and sustainability. Nearly 170,000 consumers have attended the bio-fairs and were sensibilized on healthy diets and nutrition. Surveys have identified increased dietary diversity among producers and their families. Among the environmental benefits are land rehabilitation (about 32 hectares) and soil protection thanks to organic production, climate resilience and water savings through adapted production techniques, including small greenhouses, drip irrigation, rainwater harvesting, and reforestation, less pollution as urban food production has fewer transport, refrigeration and packaging needs, increased organic waste recycling (0.65 tonnes of waste per family per year) and enhanced biodiversity (e.g. 72 edible plant species are maintained in gardens). In sum, the improvements in access to and local availability of healthy food for vulnerable groups (both producer and consumer families) can be considered the main impact of the programme. Increases in income, personal empowerment and improved relations within the family as well as the community are other important impacts, as is the conversion of abandoned and waste spaces to productive land. AGRUPAR could well serve as a model for other cities and form the basis for a national policy on local production. CONQUITO has favoured observation tours and exchanges of experiences as well as transfer of methodologies, including among ministries and NGOs, for example the Ministry of Agriculture, Livestock, Aquaculture and Fisheries and the Peace Corps. Since 2015, AGRUPAR contributed to both the City Region Food Systems Project of FAO and the RUAF Foundation, which evaluated Quito’s food system. As a result, AGRUPAR staff decided to work towards a food policy for the city in a more systemic sense, within which urban agriculture is a strategic activity. AGRUPAR was developed on the basis of a broad, largely women-led community consultation. It explicitly recognizes the role of urban agriculture for wider social, ecological and economic development and works along the entire food chain.